You Asked! We Have Delivered! We are excited to announce we will be adding 25 cubic yard bins to our fleet to better serve you in different aspects of your business! These will be great for larger construction or clean out projects. 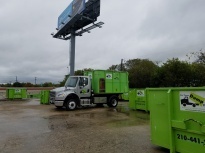 We are looking to getting them on the ground and rolling by July 2017.In addition to these new sizes of bins we have added more inventory to our existing fleet, to insure we are meeting the demands of all our customers.We will continue to provide our protective board system to help prevent any damage on driveways and of course sweep up before we leave. The past couple of weeks have been exciting for Bin There Dump That.We are growing and in addition to our inventory we have added a few new names and faces! We have brought on board two new drivers, Ferras and Randy, and two new office assistants Kendall and Dominique. These new employees will meet or exceed the standards that you're accustomed to receiving. We will be closed Saturday, May 27th through Monday, May 29th, and will reopen on Tuesday, May 30th at 7am. Please make sure to have all orders in and confirmed by Thursday, May 25th by 3pm to ensure that your dumpster will be taken care of.